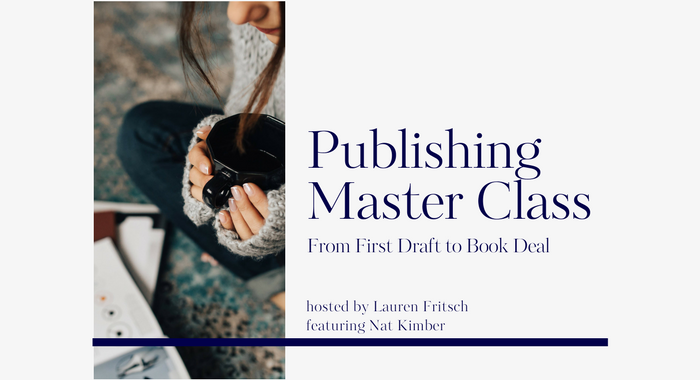 Publishing Master Class is now available! Please join me for an online master class all about the world of traditional publishing. - Why some (well known) authors receive $5,000 while others receive $2 million. - What editors and agents are looking for in a proposal or manuscript. - The best way to find an agent for your book. - How to think like an editor from your first steps into writing. - How to set realistic expectations and goals for your book projects. You'll leave with tangible action steps to take as you achieve your goal of publishing a book with a major house. This master class is really important to me because I've wanted to write a book forever. In fact, I have several projects clocking in at over 50,000 words just sitting in my Evernote. And while I've watched with interest as the self-publishing world and Print-On-Demand resources have democratized the process of being an author, I've still held back. Deep down, if I'm really honest, I want what I think of as an old-fashioned book deal. The kind with an agent and manuscript. A hardback release and a book tour. And if I'm really honest, I'd also like a shot at a New York Times Best Seller. Now, there are many reasons to go the self-publishing route these days, and I believe it's a truly wonderful option for many types of projects; however, if you're curious about the traditional publishing industry, and want to know more, read on. I follow a bunch of different thought leaders and writers. I love books and have started to learn more about the industry. Heck, I even handled some publicity, merchandising and book tour events for a TV writer-turned-author back in 2008 and 2009. Still, I've found out recently some surprising information that made me scratch my head and then go looking for answers. For example, one very well known author in the self-help space received only a $5,000 for her first book!? She's gone on to publish two more books and has now begun to self-publish. Another startup business guru received a whopping $500,000 for his most recent book deal. And yet another fiction writer got a three book contract with a $2 million advance. And of course it's not all about the money. Publishing a book can confer a whole host of additional benefits far beyond the paycheck: invitations to speak, connections with other writers, a level of prestige that unfortunately doesn't accompany self-publing- just to name a few. So, I'm really excited about this opportunity to get inside the head of a book agent and learn more about writing and selling in the traditional publishing world. This on demand master class is $75. Click here to purchase. Nat joined The Rights Factory in 2014 and continues to work with authors of adult trade fiction and non fiction. She started her career in publishing as an assistant to Muriel Nellis at Literary and Creative Artists Inc., and later worked under Dr. Carole Sargent at Georgetown University’s Booklab, where she developed academic and trade book proposals, fiction titles, and edited books for New Academia Publishing. She graduated from Georgetown in 2010 with a BA in Liberal Studies with a focus in Theology and Latin, and is a Caux Scholar. She subsequently founded the Sun Rae Agency, with a view to represent authors with provocative, inspiring books that challenge and change the literary landscape.